#62-04567 was built in 1963, and served somewhere until October, 1966, when the Army began keeping computerized records. It was in Vietnam with the 611 Trans. Co. until Feb. 1968, when it began a three year duty with the Deans (12O AHC) as a "Red Razorback"gunship. It then joined the Navy as a Seawolf (HAL-3) for a year. Following a year's refit at Bell and ARADMAC the Huey came to Ft Rucker where it served as a training craft for 3 1/2 years before being sent to the Army Reserve's 695 Trans. Co. in St Paul, Mn. When the 695th was disbanded in 1980, it was substantially cannibalized and the empty but repainted hull was sold to a VFW post in northern Wisconsin. They were unable to care for or properly display it, so the 397th Engr. Bn. of Wisc. Nat. Guard stored it in various places until I heard about it in late 1997 and arranged to have it shipped here for restoration and mobile display. #04567 was a sad sight on arrival in Ft. Lauderdale! Not a single removable component remained in the crew / cargo cabin. About half of the devices had been removed in the side compartments and most wire harnesses had been cut. There was a transmission, but rain had been coming into it through the open-topped mast for many years. Marauding neighborhood kids had broken all plexi except for the front windshields. The only part in the tail boom was the final 90-deg. gearbox. Now, however, in April, 1998, it has been transformed! Working alone, but with the help of Bob Smith (ex-l Cav) of Colony Helicopters in LaBelle, Fl. and his bone yard of UH-1Bs, and others, I have reinstalled over 95% of all items in the helicopter, all used and damaged parts, for visual display only. Only the main rotor and cowls remain to be installed! Next comes design, assembly, and installation of a low-profile trailer, then stripping and painting the aircraft, and finally rotor installation. Whew!! I will be painting and outfitting the helicopter to recognize the three periods of its very active career (2500 combat hours, 1000 hours at Ft. Rucker). The right side will be painted for Army 120 AHC (Razorbacks). The left side and nose will be Navy Seawolves (HAL-3), and the interior has (Rucker) red seat covers. 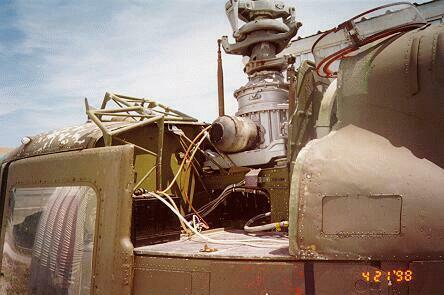 Further in the interior, in keeping with one of the 120AHC missions of perimeter security at Ton Son Nhut, I will install a large xenon searchlight (from M-151 jeep) on the left side and a non-firing M-60 on bungees on the right. I already have correct crew chief and pilot outfits with helmets to complete the show, along with large-print informational placards. Of some interest is an electric motor drive I have prepared. I connected a 12-Volt battery through a solenoid and a current-limiting golf cart resistor to the paralleled armature and field of the large 300 A, 28 V generator on the side of the main gearbox. When energized, it spins the rotor system up to about 40 rpm (much more at the tail rotor, of course). The final design will incorporate a solid-state speed controller running from the original 24V aircraft power system. Very impressive, considering there is no engine! I envision a show turnup accompanied by recorded actual turnup played through our large speakers, all preceeded, of course, by high volume Ride of the Valkyries by Wagner. I have been contacted via the Internet and other means by several UH-1 crew and pilots, including 7 so far who flew this ship. 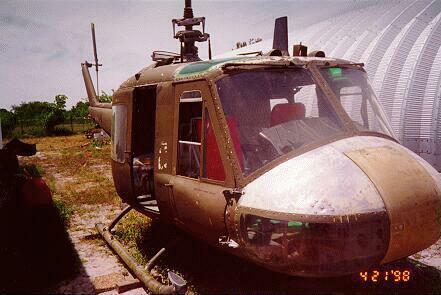 One ex-Chief who lives in nearby Miami Beach was wounded in this helo (not seriously), and I still have the entry and exit holes from his WIA! Jim Basta of Florida VHPA and I would like #4567 to become a focus for area ex-crew and for 120 AHC and Seawolf reunions. Being featured on your website will help to get these guys together. In a larger sense, I have discovered, since learning of its history and talking with those who flew these helicopters, that I am not this piece's owner. I am only the custodian, responsible for its restoration and care. 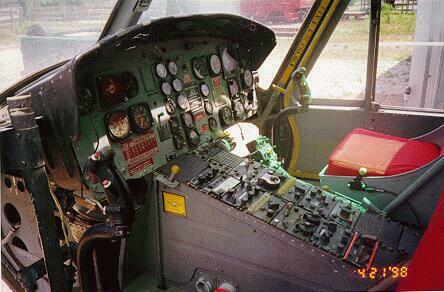 It belongs to the men who piloted, crewed and maintained it. Go here for more pictures of the restoration effort.